That’s a good question. A killer throwback playlist or a live DJ can be hard to come by. So we were psyched to partner with Billboard in celebration of the upcoming Hot 100 Festival, occurring this August 20-21 at Great Jones Beach, to compile a guide to our favorite brunches with great tunes in New York City. The Hot 100 Festival features headlines like Ariana Grande, J. Cole, Calvin Harris, and Fetty Wap, just a short drive from the city. You can purchase tickets to Billboard’s Hot 100 Festival here or enter our giveaway to win a pair! Just follow @BWBrunchNYC and tweet at us which artist you’re most excited to see from the lineup using #Hot100Fest. One winner will be picked on 8/12/16. Whether or not you make it to the festival (and we hope to see you there), below are our top picks for the best brunch beats in NYC. If Missy Elliot and Wu Tang Clang are part of your dream brunch playlist, then Pig & Khao is a must try. This buzzy Filipino spot plays a solid soundtrack featuring 90s hip hop during brunch with all our favorite throwbacks. 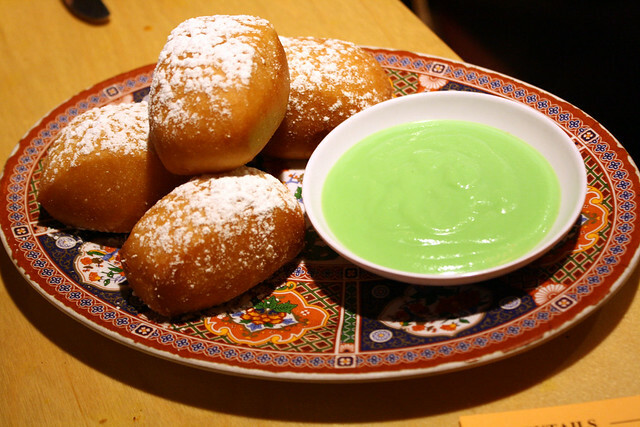 As for the food, our favorite dishes are the sizzling sisig, khao soi, and powdered sugar doughnuts. If you opt for the bottomless brunch deal, you can sip on unlimited mango, lychee, or traditional orange mimosas for $15 or relive your college days and fill up a solo cup from a bottomless Yuengling keg for the same price. Read our review of Pig & Khao’s brunch here. Pig & Khao serves brunch on Saturdays and Sundays from 11 a.m. until 3:30 p.m. If a lively, rooftop brunch is more your style, head on over to Hotel Chantelle in the Lower East Side, where your meal comes with a side of live music. The food at Hotel Chantelle is inventive and French-inspired, and some of our favorites include the stuffed French toast and the breakfast pizza, which is topped with scrambled eggs, cheddar cheese, crumbled bacon, chopped chives, and more spicy ketchup. 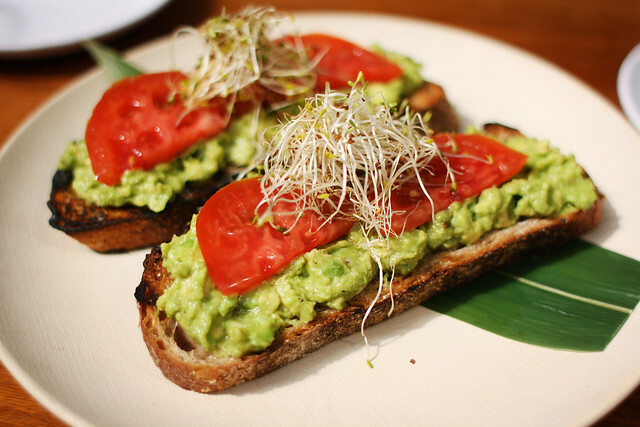 Read our review of brunch at Hotel Chantelle here. Hotel Chantelle serves brunch on Saturdays and Sundays from 11:30 a.m. until 5 p.m.
Lavo is known for its party brunch, and you can’t have a good party without great music. A live DJ provides an upbeat soundtrack that brunchgoers can dance to throughout their meal while sparklers, glow sticks, and oversized bottles float throughout the crowd. Even though people go to Lavo for the party, the restaurant definitely doesn’t slack when it comes to the food. 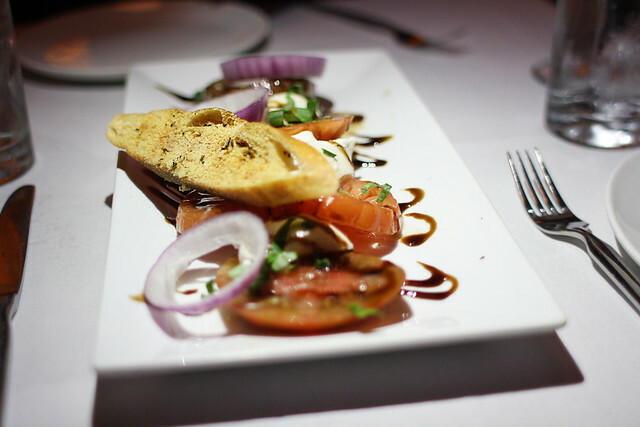 The varied menu features delicious dishes ranging from chicken and waffles to tomato bufala mozzarella. Read our review of Lavo’s brunch here. Lavo serves brunch on Saturdays and Sundays from 11:30 a.m. to 4 p.m.
Soak up what’s left of summer brunching poolside at The Beach at Dream Downtown. This hotspot consists of a beautiful pool with white chaise lounge chairs and a sandy area with umbrellas in an outdoor space at the Dream Downtown. Clubby beats, strong drinks, and tasty dishes like soft shell crab sandwiches, quinoa tacos, and avocado toast provide enough fuel to keep the poolside party going all day long. Read our review of Brunch at Beach at Dream Downtown here. The Beach at Dream Downtown serves brunch daily from 8 a.m. to 11 p.m. for hotel guests, and Monday through Friday at 11 a.m. to 11 p.m. for non-hotel guests. If you’re looking for a fancy pants brunch at an iconic NYC restaurant, make a reservation at Rainbow Room ASAP. The space is sophisticated, and the views of Central Park alone are worth the $125-per-person price tag. Sunday brunchgoers will be treated to live jazz and swing music during their meal. 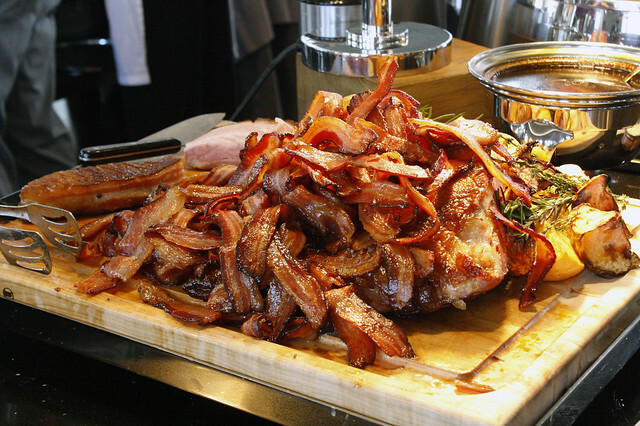 Guests can order as many items as they want from the a la carte menu and the various buffets — the Bacon Bar is a must. Other highlights include complimentary caramel monkey bread and housemade cheddar bacon biscuits and a fresh juice bar. 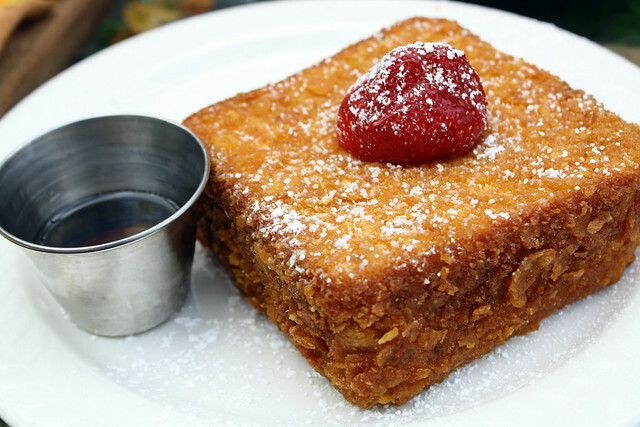 Read our review of brunch at Rainbow Room here. Rainbow Room serves brunch on Sundays only from 11:00 a.m. until 3:30 p.m.